Once your event is saved as a draft or made live, you will need to manage it in order to monitor your ticket sales and make any edits to the event. The Manage Events page allows you to manage multiple events at once and get summary information about all of your events: past, present, and future. On this page you can view: live events, draft events, suspended events, and past events. You can navigate the page to edit, view, customize, or obtain event information and reports, and duplicate recurring events to save time in the future. The Manage Events page can be accessed by clicking the Manage Events link at the top of the page. Your events will display on the Manage Events page as one of four possible types: Live Events, Draft Events, Suspended Events, and Past Events. Each event type comes with a series of actions that can be applied to the event. A Live Event is an event that you are promoting and selling tickets to. In order to begin inviting attendees and offering tickets to an event, it must be listed as Live. Available actions for Live Events include Edit, View, Information, Customize, Publicize, Suspend, and Duplicate. Edit – Clicking the Edit link will take you to the Create Event page where you can adjust any information you’ve previously submitted or add additional information about your event. You are not able to change any ticket type that already has sales. To edit such a ticket, you can change the ticket sale end date and create a new ticket type with a slightly different name. View – Clicking the View link will take you to your event page. This is the page buyers will see when they go to purchase tickets. Information – Clicking the Information link brings you to the Event Information page. This page contains your event page URL, a summary of how much time remains until your event, details about your ticket sales, and buyer and attendee reports. More – Clicking the More link reveals more options for event management including Customize, Publicize, Suspend, and Duplicate. Customize –Clicking the Customize link brings you to the Customize page, where you can control advanced customization features such as creating a custom URL for your event, adding pledge forms and/or waivers, and customizing your ticket numbering. Publicize – Clicking the Publicize link will bring you to the Publicize page, which has a variety of tools that allow you to share and promote your event through social media, email, and your website. Suspend – Clicking the Suspend link stops ticket sales for your event. You will be prompted with a dialog box asking you to confirm that you want to suspend the event so that you do not do so in error. 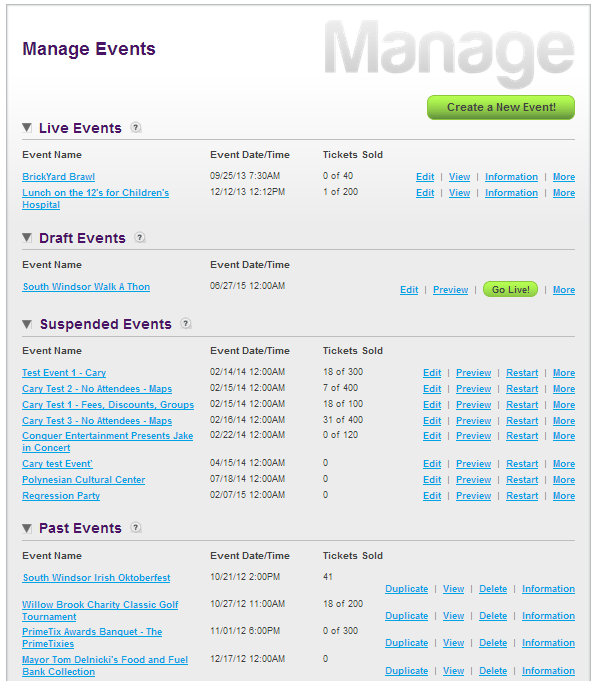 When an event is suspended, it is moved to the Suspended Events section of the Manage Events page. It can be restored by clicking the Restart link. Duplicate – Clicking the Duplicate link will duplicate your event and opens it in the Create Event page so that you can edit it. A Draft Event is an event that you have created and saved, but it is not yet visible to the public. Once you make the event Live, it will be moved to the Live Events section. Available actions for Draft Events include Edit, Preview, Go Live!, Information, Customize, Duplicate, and Delete. Edit – Clicking the Edit link will take you to the Create Event page where you can adjust any information you’ve previously submitted or add additional information about your event. This includes adding or deleting ticket types. Preview – Clicking the Preview link will take you to the Preview page where you can view your event page. This is the page buyers will see when they go to purchase tickets as soon as your event is made Live. Go Live! – When you click the green Go Live! button you change your event status to Live, and publish the page so that you can start promoting the event and selling tickets. Be sure to click the Account link at the top of the page to complete Payment and Account information so we can pay you when the event is over. More – Clicking the More link reveals more options for event management including Information, Customize, Duplicate, and Delete. Information - Clicking the Information link brings you to the Event Information page. This page contains things such as your event page URL and a summary of how much time remains until your event. Customize –Clicking the Customize link brings you to the Customize page, where you can control advanced customization features such as creating a custom URL for your event, adding in pledge forms and/or waivers, and customizing your ticket numbering. Delete – If you decide that you no longer wish to use the Draft Event you created, clicking the Delete button will remove it from the system. You will be prompted will a dialog box asking you to confirm whether or not you want to delete your event so that it does not get removed in error. A Suspended Event is an event that was Live but has been taken down, for reasons such as cancellation or postponement. Available actions for Suspended Events include Edit, Preview, Restart, Information, Publicize, Customize, and Delete. Restart – Clicking the Restart link will make the page Live again. It will move the event back to the Live Events category, and buyers can resume purchasing tickets. More – Clicking the More link reveals more options for event management including Information, Publicize, Customize, and Delete. Customize – Clicking the Customize link brings you to the Customize page, where you can control advanced customization features such as creating a custom URL for your event, adding in pledge forms and/or waivers, and customizing your ticket numbering. Delete – If you decide that you no longer wish to use the event page you created and you have not sold any tickets, clicking the Delete button will remove it from the system. You will be prompted will a dialog box asking you to confirm whether or not you want to delete your event so that it does not get removed in error. If you have already sold tickets to the event, you will need to refund the purchase price to your customers. Once an event is completed it becomes a Past Event. You are able to view past events for up to one year. Available actions for Past Events include Duplicate, View, Delete, and Information. View – Clicking the View link will take you to your event page. This is the page buyers saw when they went to purchase tickets. You will see an image that says “Not Available” where the ticket information box would typically be, as the tickets are no longer on sale. Delete – If you decide that you want to permanently delete an event, clicking the Delete button will remove it from the system. You will be prompted will a dialog box asking you to confirm whether or not you want to delete your event so that it does not get removed in error. Information - Clicking the Information link brings you to the Event Information page. On this page you can review the event’s ticket sales and read the Buyer Report.